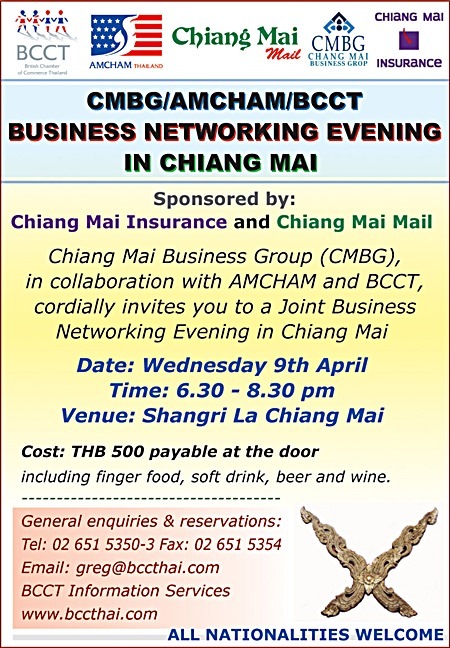 The Chiang Mai Business Group (CMBG) is holding a business networking meeting for professionals at the Shangri La Hotel on April 9, 2014. 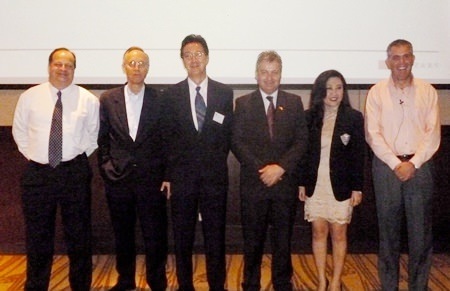 The Business Group is working together with the American Chamber of Commerce (AMCHAM) and the British Chamber of Commerce Thailand (BCCT) to offer this great opportunity for like minded business people to meet, network and find connections. The Chiang Mai Business Group has been working to promote Chiang Mai businesses both in Thailand and overseas through both local and Chamber connections. This business professional event is being held at the Shangri La Hotel on Wednesday, April 9, 2014 beginning at 6:30 p.m.
An entrance fee of 500 baht payable at the door includes finger food, soft drink, beer and wine.